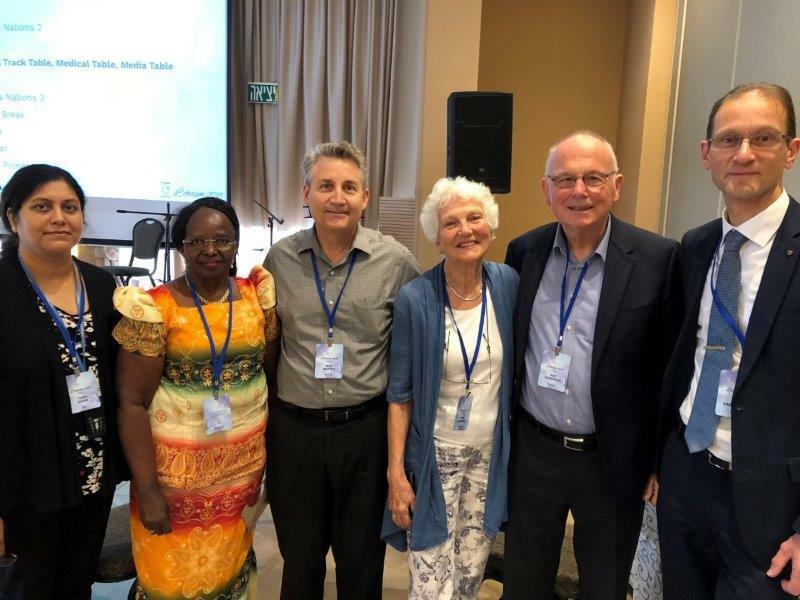 I recently had the joy and pleasure of being in Israel where I spoke at an international pro-life conference. It was my first visit. L’chaim (To Life!) 2018 drew participants and speakers from around the world. It was a great time to see old friends and make new acquaintances. Those presenting workshops and keynote addresses represented over 12 countries. The itinerary was aggressive, beginning in the early morning and usually going late into the night. It was a traveling conference of sorts with most of the events held in the beautiful Judean Hills. Comfortable buses moved us from one location to another, allowing us to see a good portion of the country. Our conference host was Be‘ad Chaim (Pro-Life) Israel which operates multiple pregnancy help centers. In my voluntary role as President of the International Right to Life Federation (IRTLF), I spoke about the roles of the organization and its member countries in protecting innocent human life around the globe. Later that evening I led a tribute to Dr. and Mrs. Willke who played central roles in helping organize worldwide pro-life activity. Jack was a founding member of the IRTLF and its president for 28 years. Immediately following this, I presented a keynote address on the effects of abortion on men, sharing why men are affected, the symptoms we often see and how to treat these symptoms with peer-to-peer counseling. The enthusiastic response from attendees was encouraging, and it appears that men will be helped in various countries, including Budapest, Hungary. The next morning Bobby Schindler, president of the Terri Schiavo Life and Hope Network, Alex Schadenberg, head of Canada’s Euthanasia Prevention Coalition, and I presented information on assisted suicide, euthanasia, the definition of brain death and the ethics of treating chronically and critically-ill patients. Afterward I moderated a panel of experts in the field of euthanasia and assisted suicide. They were a very impressive group of people. 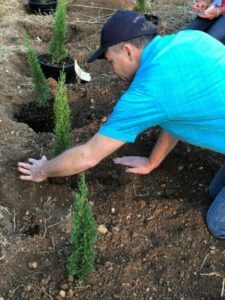 One of the most meaningful stops for me personally was a visit to the Gardens of Life where the lives of babies aborted, miscarried or stillborn are memorialized by loved ones who plant cedar trees in their memory. I planted two in honor of identical twin grandsons, Levi Timothy and Zachary Christian Mattes, who died by miscarriage. The somber event was largely quiet except when the sound of women weeping for their aborted babies pierced the silence. Minutes before this got underway, I recorded a radio interview with my good friends at Your Network of Praise, a group of radio stations in western and northwestern United States, headquartered in my home state of Montana. Thanks to technology we talked as I stood among a grove of olive trees with the skyline of Tel Aviv in the distance. Additional topics covered during L’chaim 2018 included: adoption, women’s grief after abortion, engaging young people in the movement, the work of pregnancy help centers and the medical consequences of abortion. In addition, we celebrated the 30th anniversary of Be‘ad Chaim with song and birthday cake as we rejoiced for the many lives spared from abortion. One of the days included dining on fish next to the Sea of Galilee and later taking a boat out onto the water. We also visited a Member of Parliament at the Israeli Knesset, the equivalent of Congress. Another poignant moment of this extraordinary trip was our brief visit to Yad Vashem – The World Holocaust Remembrance Center. No culture suffered more under Hitler’s regime than the Jewish people. We stayed in the Golan Heights at a resort within two miles of the Syrian border. It’s the first time I’ve seen a bomb shelter provided for guests. 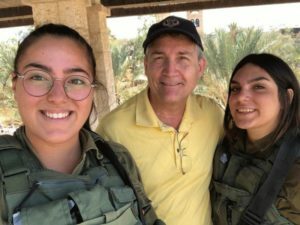 However, Israel’s persistent vigilance made us feel totally safe. Every young person is required to serve in the military, so their presence was everywhere. Before traveling to the Golan Heights, we visited the Jordan River and looked across the water to Israel’s neighboring country of Jordan. Then it was on to the Dead Sea, the earth’s lowest point on dry land. Friday evening, we enjoyed each other’s company at a Kabbalat Shabbat dinner, traditionally held before the Sabbath. A trip to the northern part of Israel brought us within yards of Lebanon. The unmistakable sound of soldiers practicing at a nearby gun range reminded us of the Middle East’s untenable peace. After brief visits to Capernaum, Magdala and the Mount of Beatitudes, we concluded the conference at a beautiful hotel on the Mediterranean. Sadly, we arrived after dark and I had to catch a cab to Tel Aviv for a 1:00 AM flight home, but I heard the waves. Check out additional pictures of my trip. My profound thanks to Tony Sperandeo and Sandy Shoshani at Be‘ad Chaim for such an amazing event! It was a reminder that we have fellow brothers and sisters with us in the mission to end global abortion. But who’s that old guy in all the pictures? Oh, he who is without crows feet may cast the first stone. Great hearing from you Fr. Dale! Looks and sounds like a marvelous, fruitful trip, Brad! It was great to work with you. Thank you for making the euthanasia seminar into a success.